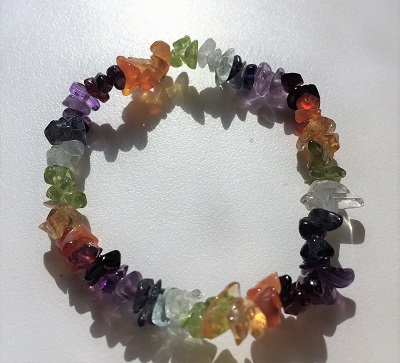 Vibrantly colored Chakra Crystal quartz chip bracelet strung on 6 inch elastic cord. 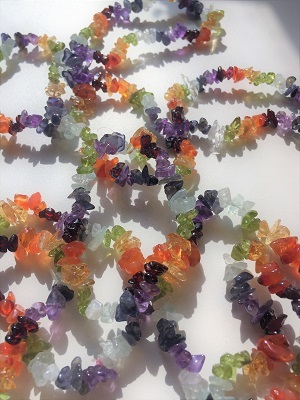 This beautiful Chakra bracelet is made from crystal chips of Blue Kyanite, Clear Quartz, Peridot, Citrine, Carnelian, Garnet, and Amethyst. Chakras are basic energy centers or vortexes found in the body and auric fields. Chakra by definition means the "wheel," representing moving energy or a vortex. 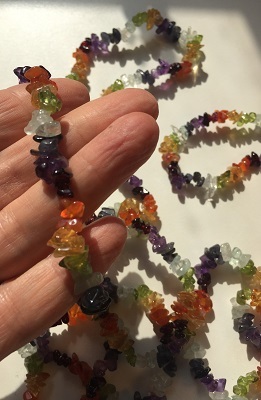 Chakra energy regulates consciousness and when a crystal is placed on each chakra, the color and energy of that stone will resonate to each chakra, restoring balance, harmony in mind, body and spirit. When chakras are blocked or an event impedes the natural energy flow, the chakras may need stimulation to become active again, as our health and well-being depends on having balanced, active chakras.